When boiled, the flavors of the sauce, which is mixed with citronella, chilly, vegetables, fish, shrimp and meat, are very sweet-smelling. Lau mamroam is scoop out into bowls and served with soft noodle soup, simply but deliciously. Goi buoi is available at the majority of famous restaurants in Ho Chi Minh City. The major substances to prepare for the dish include shaddocks mixed with fresh shrimps, pork, and dry cuttle-fish. 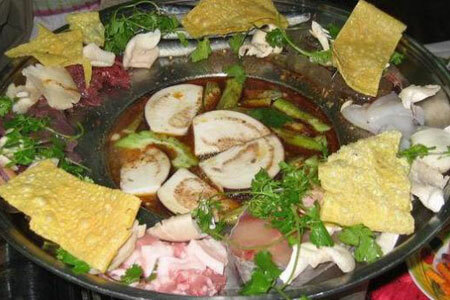 The dish is originated in Miet Buoi, Bien Hoa City.